Neck dissection is usually recommended to remove cancer that has spread to the lymph nodes of the neck. Cancers spread by dispersing through small channels, captured in lymph nodes that serve as filters. Cancer cells take up residence and grow within lymph nodes. Some cancer spread by invading blood vessels and spreading to other parts of the body. But most head and neck, thyroid, salivary gland, non-melanoma and melanoma skin cancers spread to nearby lymph nodes first, and spread to other areas of the body much later. 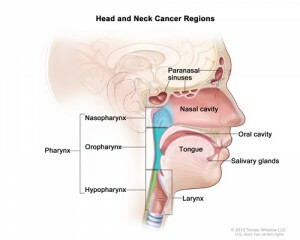 This diagram illustrated the head and neck cancer, noting the location of paranasal sinuses, nasal cavity, oral cavity, tongue, salivary glands, larynx, and pharynx (including the nasopharynx, oropharynx, and hypopharynx). Courtesy of the National Cancer Institute. - See more at: http://pubweb.fccc.edu/cancerconversations/2013/04/neck-dissection-not-so-radical-any-more/#sthash.S20rYULS.dpufThere are 300 or more lymph nodes in the neck, and hundreds more in the rest of the body. If cancer has spread to a lymph node to produce a lump in the neck, smaller pieces may also have spread to some of the other nearby lymph nodes as well. Removing only the obviously abnormal lymph node may not be enough. When surgeons began to perform neck dissections in a standardized fashion initially described by George Crile, patients began to survive their cancers. It was a major advance, and remained the standard of care for decades. However, the routine sacrifice of important nerves and muscles caused limitations in movement of the shoulder, pain and a cosmetic deformity. Over time, technical advances in surgery and a better understanding of how cancers spread lead to less radical operations. It is now often possible to remove a cancer through small, well-hidden incisions. A routine home exercise program is recommended at Fox Chase Cancer Center and has resulted in patients experiencing excellent function. Today, it is relatively uncommon to have diminished function or cosmetic deformities after neck dissection.